Metropolitan Palace Hotel Dubai - Dubai Hotel Located in Dubai City Centre, Dubai Shopping Area and Dubai Business District! 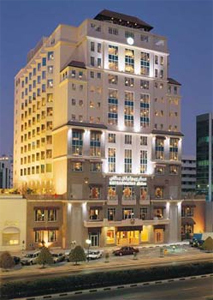 Situated on the prestigious Al Maktoum Street, The Metropolitan Hotel Dubai offers an excellent location with good public transport connections. The hotel features a swimming pool and a sauna. All suites and rooms offer air conditioning, a seating area, an en suite bathroom and a flat-screen LCD TV. Some of Metropolitan Palace Dubai’s rooms also include a work desk and a refrigerator. The Metropolitan features several restaurants, including the Lebanese-style Al Diwan and the Downtown Bar & Grill. In addition, The Sketch is a cocktail bar serving fusion food in a stylish location. Guests can relax in the hotel’s sauna and outdoor pool. The hotel provides a shuttle service to the 5* Deluxe Habtoor Grand Resort & Spa, located on Jumeirah Beach . Guests of the Metropolitan can make use of the Habtoor’s facilities and beach area for a minimal fee. The Metropolitan is located just 10 minutes’ drive from Dubai International Airport.